This peaked cap in red wool tweed was designed as a ladies' motoring cap. Motoring became a new pastime in the early twentieth century creating a simultaneous demand for suitable clothing. Both men and women wore soft peaked caps when motoring, though this style of hat was also available in leather. The peak of the hat was often worn to the back of the head to prevent the hat from being blown off. Alternatively 'Motoring veils' were worn to keep hats in place, these ran around the top of the hat and tied in a large bow under the chin. 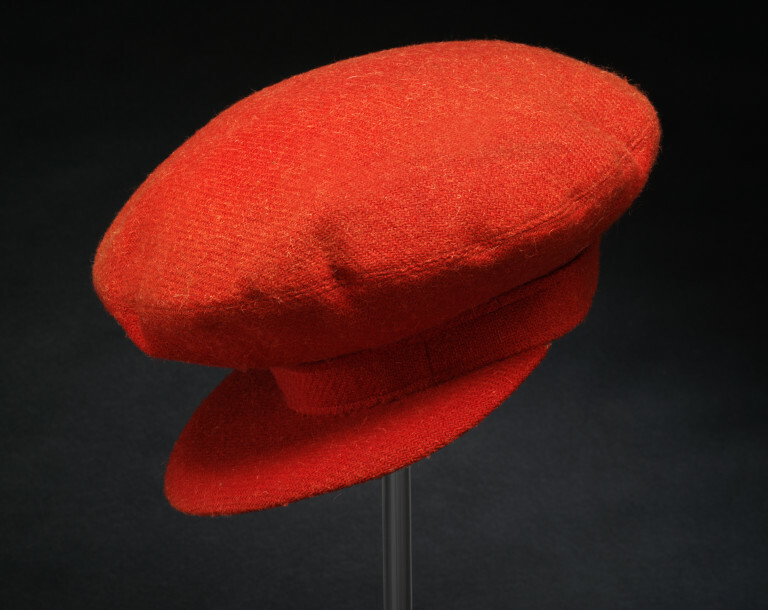 This cap was made by Woodrow, a millinery firm based at 46 Piccadilly Street London. They also had premises at 42 Cornhill in London as well as Manchester, Liverpool, Glasgow and Dublin. Woodrow made a variety of hats and were not just distributed around the British Isles but had an international circulation. An advertisement in Australia's Sydney Mail on 4th September 1935 stated 'Woodrow Hats are British. Manufactured from the finest quality English & Scotch furs. Obtainable to First-Class hatters and stores for men.' 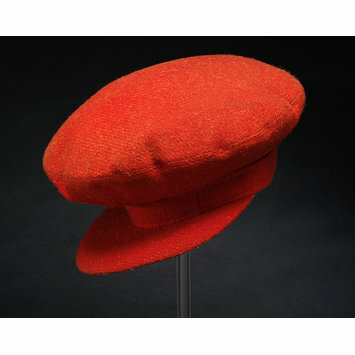 The advertisement also declared the hats were issued with a Royal warrant by King George V.
Peaked hat in tomato-red wool tweed. Lined with silk.